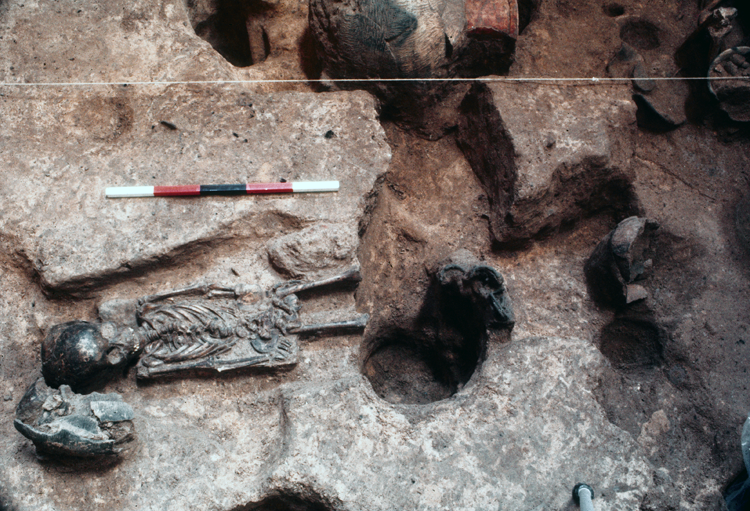 The Ban Chiang excavations yielded rich evidence of burial practices that changed over a two-thousand-year span. Much of the evidence about the ancient society unearthed at Ban Chiang comes from the human burials. The 1974 and 1975 excavations at Ban Chiang recovered 142 individuals from burials, documented in situ with associated grave goods. While pottery was by far the most common grave good, many burials included bone tools, clay pellets, glass beads, adzes, spear points, bronze and iron bracelets, and sometimes parts of animal skeletons placed over or alongside human skeletons. Three factors make it easier for archaeologists studying the Ban Chiang cultural tradition to identify distinctive cultural/stylistic changes in burial practices. At Ban Chiang there is a relatively large and comprehensive sample of burials to evaluate and the burials from both the 1974 and 1975 excavation sites were distributed over the two-thousand-year span of prehistoric human habitation documented there. Each burial was like a time capsule. Because skeletal remains were found interred with grave goods, both were clearly associated in time and cultural context. When grave goods are excavated, they tend to be relatively intact artifacts, as compared to items that might have been tossed on a refuse pile or broken during daily life—so the Ban Chiang grave goods yielded very rich data. Early Period (2100-900 B.C.) BCES Burial 55 is a “flexed” burial of a 18-20 year-old adolescent female, BCES Burial 63 is a 1 month-old infant buried in a clay “jar”, and BCES Burial 33 is a “supine” burial of a young adult female. Middle Period (900-300 B.C.) BCES Burial 12 is a 1 year-old child. Grave goods found in the burial include ten shattered pots, two copper-base bangles, and two iron blades. Late Period (300 B.C.-A.D. 200) BCES Burial 8 is a 3 year-old child. Grave goods found in the burial include three painted pots and four rollers.